Every so often, the narrative of Cuban popular music is shaken by the emergence of an unprecedented collective that starts expressions of amazement for its capricious conformation or for the excellent quality of the musicians on its roster. The examples of the Conjunto Matamoros with Benny Moré, Los Amigos, the Cuban Orchestra of Modern Music, Irakere, NG La banda, Opus 13, Afrocuba, Buena Vista Social Club come to mind without pretensions of a meticulous chronology. Thus, although the roots of its gestation go back two years ago and, for a change, not precisely within our borders, this 2019 surprises us with the emergence of The Committee, a septet made up of nothing more and nothing less than by Harold López- Nussa and Rolando Luna on piano and keyboards, Rodney Barreto (drums), Yaroldy Abreu (percussion), Gastón Joya (electric bass, double bass), Carlos Sarduy (trumpet), and Irving Acao (tenor sax). A true who is who of contemporary Cuban jazz. It is enough to look at his history as session musicians, his works as solo artists (just to mention an example, Harold is part of the Quincy Jones Mack Avenue Records catalog), the lineage of the groups they have been part of or simply his demonstrated virtuosity, that bursts with this first disc titled in an innocent way: And that!? So what, An entire declaration of principles. It is inevitable to ask: Will we be in the presence of a supergroup? 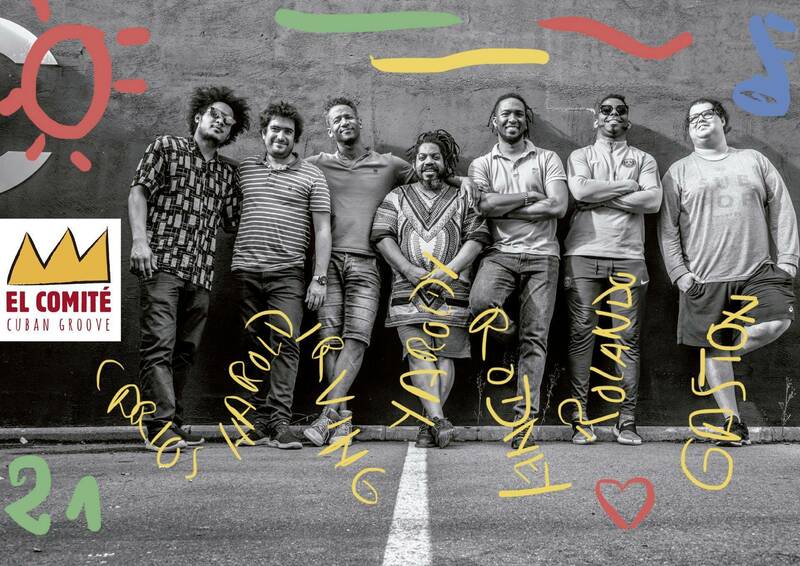 The album proposes nine tracks signed by five of its seven members and reboza of funk, timba, bolero, son montuno, as a sample of the wide possibilities of hybridization and generic miscegenation offered by contemporary Afro-Cuban jazz in the hands of broadly solvent musicians. So, open with the compasses of Gran Vía, funk composed by Harold López-Nussa as an introduction to the ensemble and which, on the verge of six minutes, concludes in a fade-out that remains certain impact to the presentation. Continue with E 'cha, also signed by Harold, an elegant and rhythmic theme that rocks on a suggested cha-cha-cha, jumps into a light montuno and takes up the original motif. The Gypsy woman, by Gastón Joya, is an interesting composition whose structure was created with the double bass as the protagonist in solo interludes and as free support for the instrumentation. Irving Acao signs a beguiling ballad in Nothing else and Carlos Sarduy, whose trumpet passages from the time of Interactivo offer ambience and suggestive motives, proposes Carlitos' swing, montuno-timba-jazz with an attached choir designed for the dance floors and that will have a safe place in the concerts of the album that they have agreed to from April of this 2019. Yaroldy Abreu and Rodney Barreto, although they do not sign any theme in this debut, provide a remarkable rhythmic solidity in all this range of music - listen to the afrobeat of Alamar 23, also by Carlos Sarduy- and leave a mark of his skill in Transitions, pearl of Latin jazz to the account of Rolando Luna who also, with his arrangement for They are Emiliano, not only proposes a tribute to such influential Cuban pianist, but allows what undoubtedly is the highlight of the album, for collective and individual lucimiento. Closing the disc and as a way bonus track, by twisting the iconic and transcendental So what from Miles Davis to the field of Afro-Cuban jazz, rumba included, The Committee denotes at the same time irreverence, freshness and creative force, in addition to functioning as a gesture to settle debts, recognizing their influences .. Without doubt, we are in the presence of a good debut album, which still does not reflect the full capacity of this new pleasant surprise for Cuban music .. With the cohesion and intercommunication offered by coexistence, rehearsals and tours, we can expect more of these "lions" of Cuban jazz. A morbid questioning assaults me and has to do with a brief review of musical history, within and beyond our borders, throwing examples of groups that went from the collective creation of their beginnings to a unique leadership. If the rule is imposed instead of the exception, who chairs this Committee? Previous Story Previous article: Ibeyi: What's your sound?